My first encounter with an Austin Healy was in 1971 when I was attempting to sell cars to farmers in a small town in Missouri. Someone had traded a '65 Austin Healy 3000 in on a new car and one of the mechanics bought it. I fell in love with that vehicle the moment that I rode in it, and knew that I would have one, one day. In 1972 I was attending night school in Independence, Missouri at the University of Warrensburg, when my Legal Business Class instructor announced that he was selling the '65 Austin Healy 3000 that he had just finished restoring. He not only included the new exhaust system that hadn't been installed, but it turned out that he was getting a divorce and moving to the northwest and his wife sort of went with the car (her choice, not his). Fortunately, for me, I was between marriages and things went well and a good time was had by all. In 1973, I opened a foreign car repair shop with a partner in downtown Kansas City, Missouri. Unfortunately, the business didn't do as well as hoped and in 1975 the business was in dire straits and I had to sell the Austin Healy to keep the doors open. The person who bought it wrecked it. To this day, I still dream of driving that car. 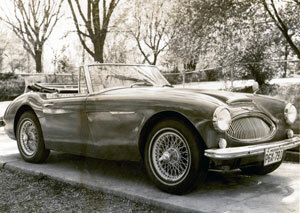 The Austin-Healey 3000 Mark III, introduced in 1963, is one of the 1950's most endearing British sports cars. That is not a misprint. By the time the Mark III was built, everything about it was obsolete, except perhaps for the character that it oozes from every curve of its muscular bodywork. By the mid-1960s the Austin-Healey was truly anachronistic, representing the style and technology of the previous decade or even earlier. That said, the 3000 Mark III is probably the most popular big Healey. It has roll-up windows and a true convertible top that really does offer good weather protection, just like the Series BJ7 cars. However, the BJ8 Series car added a walnut burl wood dash panel and a center console that combine to make this the most civilized, most luxurious big Healey built. 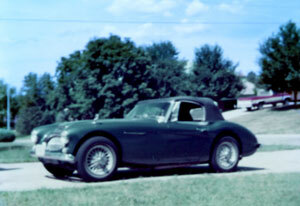 It is a wonderful car, although a far cry from its roots, the raw and simple Healey Hundred. The 3000 Mark III is more of a grand touring car. Additional improvements from the Series BJ7 include power-assisted brakes as standard, more power thanks to bigger carburetors, and a slightly softer ride. The first 1,390 examples of this model are sometimes called "Phase I" and included a cubby box at the rear of the center console. Then, about six months after production of the 3000 Mark III began, the ride height was increased and the cubby box was eliminated, with these cars called "Phase II." 16,322 examples were produced. The increased ride height was a particularly important improvement because earlier Healeys are known for scraping bottom and occasionally even knocking off the muffler when driving over relatively small obstacles!